The North American continent offers plenty of scenic drives. On the West Coast the most spectacular is probably that on Highway 1, especially the 90-mile section of coastline from Carmel to San Simeon, California, known as Big Sur. However there exists a similarly stunning but lesser known stretch of road running down the eastern side of the Sierra Nevada. 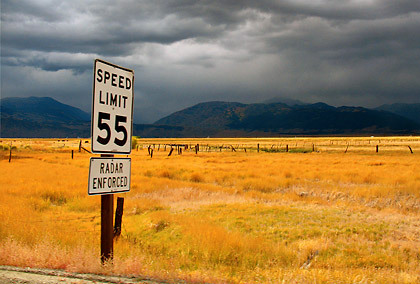 Highway 395 actually originates at the Canadian border and runs all the way down to San Bernardino, California where it merges with Interstate 15. After visiting Lake Tahoe with our friend Fel Yturralde a few years ago, we spent the night in Reno, Nevada and decided to take Highway 395 on our way back to San Diego. 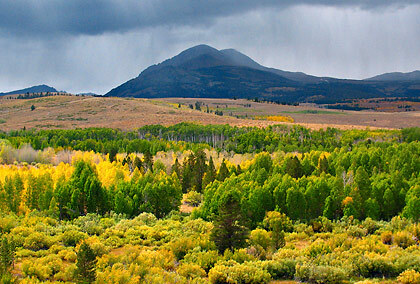 We’ve read about the varied scenery along 395 ranging from desert tundra to subalpine forest with a variety of contrasting views depending on the season and were looking forward to this trip. Fall colors along the 395 near Bodie with the Sierra Nevadas in the background. Starting from Reno we drove down the ranch lands of the Carson Valley. 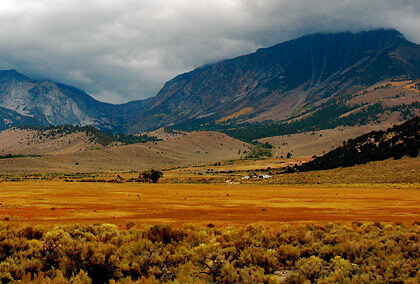 The ranch views gradually gave way to the mountain and forest views around Lake Topaz on the California-Nevada state line, then to the quaint towns of Mono County including the former mining town of Bodie. It was early fall when we came here and the clumps of trees along the roadway and in the foothills of the Sierra Nevada had become a colorful tapestry of yellow, orange and green colors. 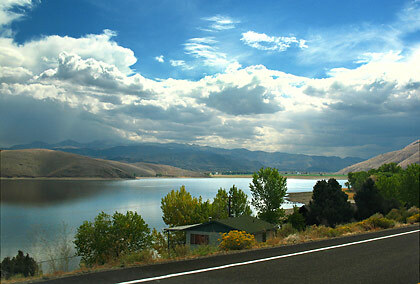 Highway 395 winding along the banks of Lake Topaz with the Sierra Nevada mountains in the background. 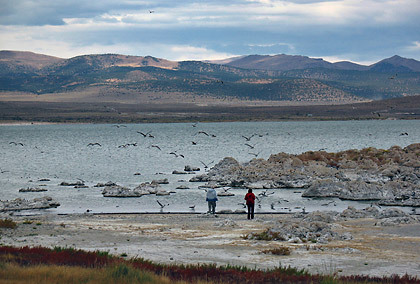 Mono County is of course the site of the popular Mono Lake which sits astride Highway 395. Mono Lake is unlike any other because of its tufas or limestone formations that tower out of the lake in strangely beautiful columns. We stopped briefly to view the lake’s western shore but didn’t get to see the dramatically tall tufas; the one we saw were much shorter than we had expected. We later learned that the best photos of Mono Lake  the ones with the tall tufa formations  may be taken at the South Tufa Grove, accessible via a 10 mile drive south from where we stopped and another drive along Highway 120. These tufas are due to the lake’s high alkaline content which also causes the queer smell we encountered when touring the lake. Mono Lake: the western shore. Just after Mono Lake is the Tioga Pass entrance to Yosemite National Park - the park’s eastern entrance and one less frequented compared to the western entrance to Yosemite Valley. A little further down south past Lee Vining is the entrance to Mammoth Lakes with the Owens Valley beyond. Because of the proximity of these two scenic spots, the area around Mono Lake is a good base for travel and as a result traffic is said to be heavy in this area during summer. 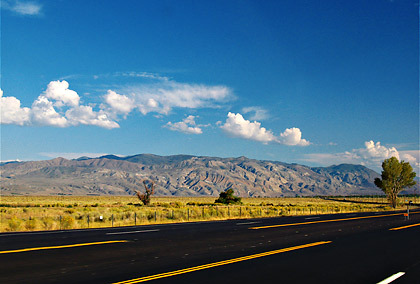 Sierra Nevada mountains towering over the Owens Valley as viewed from Highway 395. 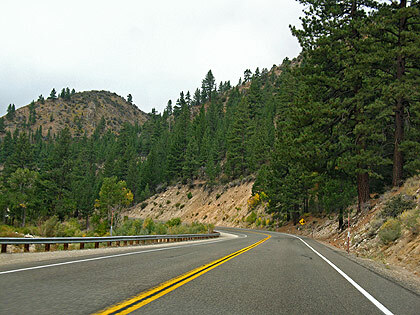 Highway 395 passes through part of the Inyo National Forest, home of the bristlecone pine. The most spectacular scenery in our opinion are the alpine views where Highway 395 runs between Mammoth Lakes and the Owens Valley and where it crosses through Inyo National Forest. Besides the excellent scenery, this area also offers a variety of tour options: Mammoth Lakes, Sequoia National Park and Forest and Inyo National Forest. There are also sweeping views of Red Slate Mountain, Mount Tom and Wheeler Crest. The Sierra Nevada has several peaks here that tower above 13,000 feet. You get a sense of awe while driving along the highway with the imposing, cloud-shrouded mass of these magnificent heights. 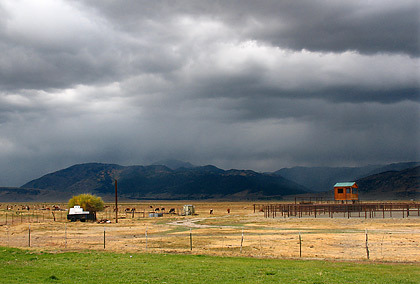 Farm scenes like this are common along the 395. Driving along 395 also takes you through small, quaint rural towns on this side of California where time seems to stand still. However, we were in for a weird shock when we saw a Philippine jeepney (complete with décor and its original Sarao markings) at Eric Schat’s Bakery in Bishop. The latter is a huge bakery and restaurant famous for its sheepherder’s bread. Fel just had to know how the jeepney got there. Unfortunately Eric Schat wasn’t around although we were told by the bakery workers that Eric was a former military guy who got posted to the Philippines, got attracted to the jeepney and brought back one with him to America. 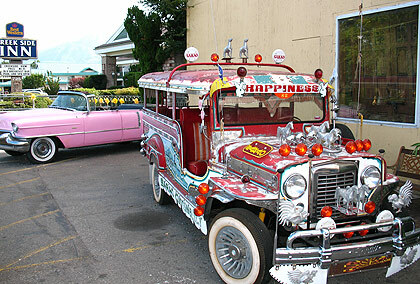 We later heard that Pinoys in the Bay Area borrow this jeepney for shows and parades. Just before driving into Bishop, the landscape had already begun to shift into dry plains of the kind we often see in western films. South of Bishop is Lone Pine, a town that appears to have come straight out of a modern-day western movie. We later discovered that Lone Pine, along with the neighboring Alabama Hills, had indeed been the shooting location for many Western movies and TV shows. 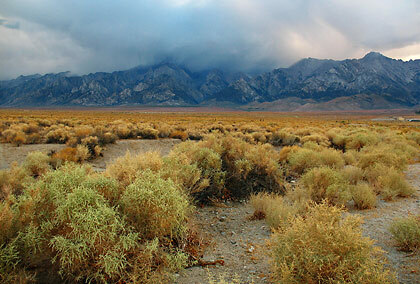 Lone Pine is also the access point for two contrasting geographical features: the lowest point in North America - Death Valley National Park and the highest point in the contiguous United States – Mount Whitney. this is an area near Lone Pine. It was already beginning to get dark as we left the last vestiges of green vegetation and entered the Mojave Desert section of 395. Somehow we even had glimpses of a few Joshua trees looming out of the dark night but it had grown too dark to see these plants in all their glory. After a brief stop at Victorville for dinner we were soon driving into the night and the urbanized section of 395 and San Bernardino County, and back to our home in San Diego. A section of the 395 head south towards the Mojave Desert. We saw a herd of bison in one of these locations. Our ride along the 395 had taken practically all of the daylight hours and a good deal of the evening with multiple stops along the way. It was a tiring but exhilarating tour, one that we’ll always think about when reminiscing about our time in America.